Maybe you are like a lot of business owners and managers out there this holiday season. You’ve done your best to make it to the end of 2018, managing to juggle your professional and personal life without it all falling apart. You’ve gotten your staff their holiday bonuses, you’ve bought (but have yet to wrap) your family’s Christmas presents, and you’ve even got your in-laws’ travel plans saved in your phone’s calendar so you know exactly how long they’ll be staying with you for the holidays. But there is one thing you’ve forgotten — an end-of-year holiday party for you and your staff! It’s definitely too late to have a holiday party this year, seeing as how we are already well into 2019! Have no fear, all is not lost, so long as you take the time to make your next party extra-special. 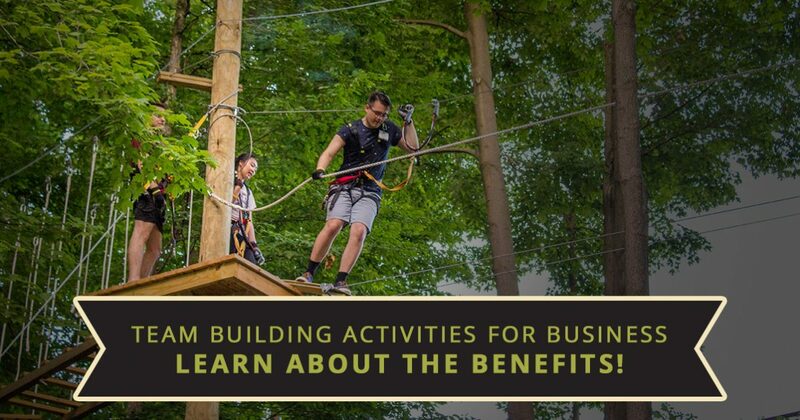 Today’s post is all about providing folks who are looking to plan a corporate outing that’s worth remembering with just a few of the many benefits that come from taking your staff to TreeRunner Raleigh Adventure Park. Keep reading if you are interested in learning more about the premier aerial adventure park in all of Raleigh and Durham! We offer 70 amazing zip lines and obstacles, complete with three difficulty levels and seven different courses. Whether your staff wants to bring their family or you’d prefer to build community with a tight-knit group, we want to tell you why our Raleigh zip line course park is worth your consideration! There are probably hundreds of ways that team building activities bring people together, whether it’s in a business context or otherwise. We won’t bite off more than we can chew in today’s post, so we thought we’d highlight just a few of the benefits, like how a corporate outing to our Raleigh adventure park can improve communication, encourage leadership, and improve morale more generally. Every manager wants their staff to be productive and happy. Generally, these two things come together when you have a thoroughly motivated employee. It’s almost always the case that a motivated employee is one that is invested in their company. Not only are they someone who has “bought in” to their work, but they are typically someone who cares about the well-being of their coworkers as well. In fact, we’d argue that your staff will be tangibly more motivated (and therefore, productive) when they feel a sense of community that comes from caring for their coworkers. But as most of us know by this point, building a positive, connected work environment isn’t as easy as snapping your fingers. It takes a positive culture and time to develop something like that; at TreeRunner Raleigh Adventure Park, we can help with the former part. What better way to get to know your coworkers than when you are working together to accomplish a challenging physical task? With three different difficulty levels, everyone will be able to find the right balance between plain-old fun, and stretching one another outside of their comfort zones. Getting your staff out of the office and outdoors among the trees so you can start bonding and having fun with each other! There’s no shortage of buzzwords when you hear people talk about corporate outings and what they hope to gain from them — we’ve even used a few of them already, like motivation, morale, and productivity! But there’s a reason these ideas get discussed so much — they are vital to the success of your business! 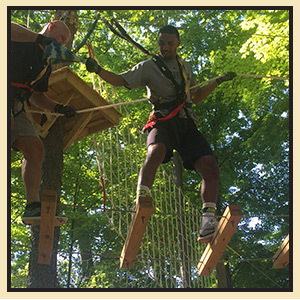 TreeRunner Raleigh Adventure Park offers you the ability to reward your staff by having fun outside for groups both big and small. We can accomodate groups that range in size from 10 people to 300! Also of note, our local ropes course and zip lines will present the opportunity for improved communication and leadership to take place. Whether your staff has been working together for decades or you are a start-up, every company could use improved communication on a daily basis. Working together to make sure your entire team completes the courses is a great way for leaders to rise up as well! At the end of the day, team building in the trees is a one-of-a-kind experience. Your staff will appreciate something outside of the box. Whether you need to make up for forgetting about your office’s holiday party or you’d like to kick off 2019 with a bang, we hope you think of us at TreeRunner Raleigh Adventure Park. We offer facilitated team building experiences as well as food-truck options for your crew! Book now if you are ready to experience the best adventure park in Raleigh, but don’t hesitate to give us a call if you have any questions! We’d love to see you and your staff have the best tree top adventure of your lives!